This is the state it was in on Thursday 19th August 1999 when I had enough and went home. In the foreground is my Woodmans Mare, this is used for holding the wood whilst it is being worked. To use the mare I sit astride it and operate a lever with my feet that clamps the wood in place and leaves both hands free to work the tools. (Usually a draw knife or spokeshave). More on the Tools of the trade. 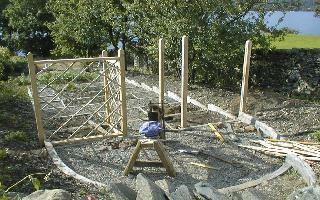 The two left hand panels are completed. The uprights are of 3x3 in. oak, re-bated1/2in. 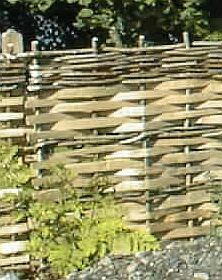 to allow for the lattice work to be held in place The lattice itself is made of riven oak (some unfinished oak can be seen on the extreme right). Another project that is being undertaken is this riven oak fence that marks the boundary of woodland and woodland garden, the timber is not smoothed after it is riven so it just might stop the horrible little monsters climbing all over it! 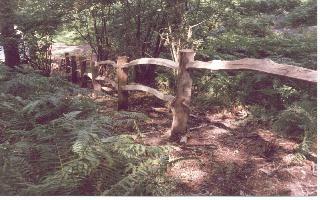 Other types of fencing using traditional hurdling techniques are used in keeping with the ethos of using mainly material from either the estate or from within the immediate area wherever possible.